Note: Although I suspect most of you know by now, I want to point out that I’ve launched Money Boss, a new blog about “advanced personal finance”. It feels great to be writing about money again! After six months of rest in Savannah, Georgia, Kim and I have resumed our road trip across the United States. 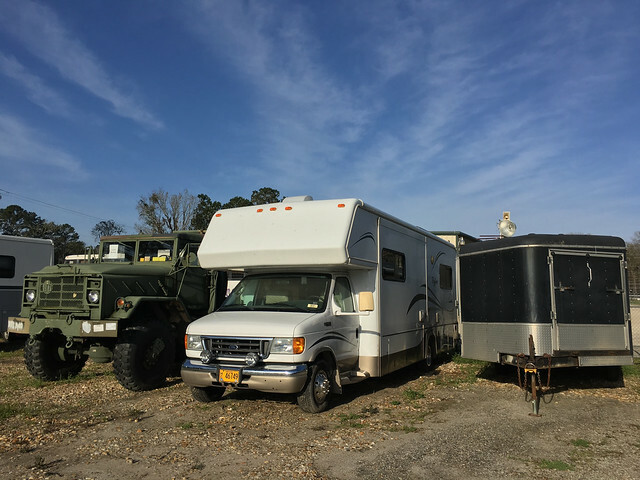 We spent last weekend loading the RV (and shipping stuff home — expensive!) Then, at long last, on the morning of Tuesday the 29th we headed west. When we left Oregon last spring, we didn’t have much of a plan. We wanted to see as much of the country as possible, but our route was up in the air. On the return trip, we have a bit more structure. For one, we can eliminate the places we’ve already been. That means there’s a lot less territory to cover on this leg. During the two weeks before we left Savannah, I spent time reading about the places we’re going. This, in turn, led to me trying to calculate the optimal route. We think we’re going to make a sort of S through the south during April and May, explore the state of Texas in June, then make our way into the Southwest again. In August and September, we’ll hover around the Pacific Northwest. If our housesitters find a place before October 1st (our target return date), then we’ll probably make a bee-line back to Portland. Based on all of this, we have a rough schedule mapped out. (This is something we didn’t do on the first leg last year.) We know roughly where we’ll be when. The first three weeks are actually scheduled — we’ve booked our stops in North Carolina, Tennessee, and Kentucky. And stop number one was Asheville. “You have to visit Asheville,” folks in Savannah said when we told them we were traveling the U.S.
“You have to visit Asheville,” readers have been emailing. Got it. First stop: Asheville. 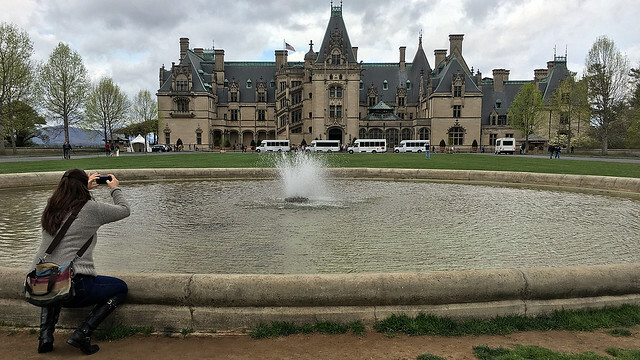 The Biltmore Estate is the best-known attraction in Asheville. George Vanderbilt — one of the lesser heirs to the Vanderbilt fortune — built this 179,000-square-foot mansion in the 1890s. For several decades, the sprawling grounds served as home for George and his family. Today, it’s a huge tourist attraction. It’s fun to stroll the grounds and imagine what it must have been like to live here one hundred years ago: sort of like Downton Abbey in the Carolinas. 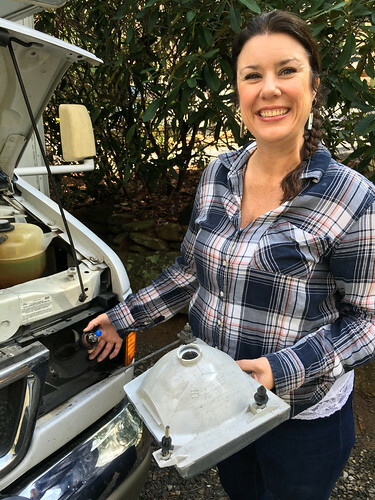 My favorite part of our stay in Asheville was the Blue Ridge Parkway, a 469-mile road that runs along Appalachian ridges in Virginia and North Carolina. I like scenic drives, and this is one of the best. Part of the charm is that no commercial signage is allowed along the road. (And I think there are restrictions on commercial buildings too.) Instead of being constantly bombarded by signs and shops, you’re treated to wonderful views of unspoiled wilderness. I like it. Kim and I also enjoyed the good food and the good beer. We enjoyed the beer a little too much, I think. 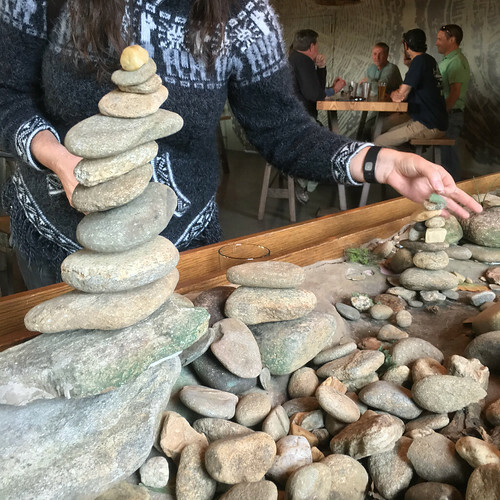 We were in Asheville four nights, and we spent four evenings at four different breweries. Yum! Another aspect of this first stop was re-learning what it’s like to live in the RV. How do things work? Where do things go? What do we do to give each other space? We had a tentative first couple of days, but now things are humming along nicely. Now it’s time to head over the mountains to Tennessee. We’re both eager to see what life is like in the Volunteer State. Our first stop will be Pigeon Forge at the base of Great Smoky Mountain National Park — and home to Dollywood. Kim is a huge Dolly Parton fan and has been looking forward to this particular place for the entire trip. I can’t recall if I’ve been to Asheville. I think I have, very briefly, in my late teens or early 20s. I do know that the mountains out there are very pretty. Muc different than the west coast, but I think they have a more haunting, cozy quality to them. Especially when you think of all the history with mining & Appalachia. Turns out it’s a great way to explore many interesting cities. I have a standing invitation out to you again if you make it near Sedona AZ where we live. Heck if you get close, we will drive out and camp in your area. It would be great to meet you and Kim at some point.